The Work Ethic - What Is It? Do You Have It? As competition for available work grows, your job will increasingly depend on your work habits. Read why the work ethic is such an important quality. Layoffs and long-term unemployment are no longer fears for many of our readers. They are facts of life! Even if you hold a steady job — even in these relatively good times, when employment seems to be on an upswing — you might do well to stop and ask yourself, Is my job secure? In these uncertain times, can you make yourself more attractive to an employer or improve your chances of holding on to your job? With increasing competition for work, your job may depend more and more on your attitude toward work. The Bible has a lot to say about the work ethic. The apostle Paul admonishes Christians, "If anyone will not work, neither shall he eat" (II Thessalonians 3:10).He continued with strong words for those who wouldn't work: "For we hear that there are some who walk among you in a disorderly manner, not working at all, but are busybodies. Now those who are such we command and exhort through our Lord Jesus Christ that they work in quietness and eat their own bread" (verses 11-12). And if they didn't listen? "And if anyone does not obey our word in this epistle, note that person and do not keep company with him, that he may be ashamed" (verse 14). "Go to the ant, you sluggard! Consider her ways and be wise" (Proverbs 6:6). What does the ant teach us? The ant, "having no captain, overseer or ruler, provides her supplies in the summer, and gathers her food in the harvest" (verses 7-8). The ant works when no one is watching. The ant is a self-starter. It has instinctive diligence, drive, desire to work and does a job when the job needs to be done. Humans must learn these important habits. Surveys show that only 10 percent of all workers who are fired lose their jobs because they can't do the tasks required. The rest lose their jobs simply because of poor work habits and personality problems. I interviewed several employers and asked them about the work habits they liked and disliked in employees. At the top of the list were dependability, responsibility, enthusiasm and interest in the job. The bosses liked those who gave them a full day's work and were loyal to the company. Employers appreciated most an employee who knew that he was hired to help his employer get a job done and beamed a positive "we can do it" attitude. He cared about his boss. Employers liked a worker who dedicated himself to doing his best and constantly learned more about his job. Sometimes he wasn't the most experienced employee, but if he grew with his job he was valuable. Exclaimed one manager about his workers, "I have some employees who have 10 years' experience and then I have others who have repeated their first year's experience 10 times!" 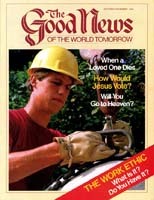 The reason for developing good work habits is because work is such an important part of God's nature. As Christians we have a duty to work, not only in this life, but also in the world tomorrow. Employers agreed that, in this age of rapidly developing technology, workers who best adjust to changes in their jobs – learning new procedures quickly and willingly and adapting to new machines such as computers — will be most secure in their jobs. Learning and growing in knowledge is a principle taught in Scripture (II Peter 3:18). Another habit employers desired in employees was willingness to work until the job got done and making every effort to get it done on time. This is how Jesus Christ worked. "My food," He said, "is to do the will of Him who sent Me, and to finish His work" (John 4:34). Of God the Father, the apostle Paul says, "Being confident of this very thing, that He who has begun a good work in you will complete it" (Philippians 1:6). Consider: If you expressed this attitude of diligence and loyal perseverance on the job, you could make yourself almost indispensable. Every employer I talked to said that if he had to lay off one of two workers doing the same job, he would keep the one who had the better work attitude over the one with greater experience. Employers also considered it important that an employee cooperate with and be liked by other employees. They appreciated one who brought up solid suggestions for improvement at the right place and time and who followed company rules. Finally, employers said good grooming, posture and appropriate, clean dress were telltale indicators of how seriously their employees took their jobs. Employers were irritated by an employee who "dragged his feet," putting forth only the minimum effort required when the boss knew the person could do a lot better. "As vinegar to the teeth and smoke to the eyes, so is the sluggard to those who send him" (Proverbs 10:26). Bosses said they were also irked by an employee who always wanted to do the job his own way. One employer said he finally fired an arrogant worker who always uttered some rebuttal whenever told to do something. The man constantly let the boss know that he thought he knew more than the boss. Employers also said they disliked someone who brought his personal problems to work. This person's mind wasn't on his job. If he talked to others too much during working hours, he would hinder their production, too. When hiring for a particularly responsible position, one employer said the first question he asked was, "Are you a good family man?" He knew from years of experience that one who had a stable family life did better work. Workers who constantly get up for coffee tell the boss that their minds aren't on their work. Many cups of coffee lead to rest room trips that further disrupt production. Employers also expressed dissatisfaction with employees who acted differently when the boss noticed them, always used up every minute of their sick time, concerned themselves with matters that were none of their business, didn't use common sense, talked to other employees excessively on the job and had alcohol or other drug problems. Many people consider work as the undesirable time period between pleasure and leisure. Recreation and relaxation excite them. Work does not. Because many people simply haven't been" taught how to work, when they enter the labor market, they have trouble holding a job. They make excuses about why one job isn't working out or why another doesn't fit them. One such person managed to drift through 50 jobs in a 10-year span! He always seemed to have something "come up," "happen" or "not work out" on his jobs. Lazy people often explain their hard luck with the greatest of skill. "The sluggard is wiser in his own eyes than seven men who can answer sensibly," affirms Proverbs 26:16. Solomon records some preposterous excuses for not working. For instance, "The slothful man says, 'There is a lion outside! I shall be slain in the streets!'" (Proverbs 22:13). Employers often lament that, although many want jobs, few actually want to work. But did you know that the most important reason for work is not to earn money? The most important reason for working and for developing good work habits is because work is so much a part of God's nature. Jesus Christ said, "My Father is always at his work to this very day, and I, too, am working" (John 5:17, New International Version). He restates His dedication to work in John 9:4: "I must work the works of Him who sent Me." We are created in God's image — not only in His appearance but, as we submit to Him, in His nature and character. The work ethic — the desire, the love for, the satisfaction gained from producing and creating — needs to be part of our nature, just as it is part of God's nature. As Christians we have a duty to work, not only in this life, but in the future as well. When Jesus Christ returns, this earth will have to be restored. Someone will have to make the deserts blossom as the rose (Isaiah 35:1). Cities will have to be rebuilt and managed. Prophecy shows that government, religion and education will be properly established. We won't just be watching Jesus do all that. We'll be helping Him. Then we will continue to expand God's Kingdom forever (Luke 1:33, Daniel 7:27). Indeed, we will look forward to imaginative, stimulating, challenging work for all eternity. We will be God — producing, creating, ruling and sharing the same exhilaration God expressed at the creation of the heavens and the earth. God has definitely not promised us an eternity in retirement, lounging in idleness and ease, of laziness and slacking off, of boredom and uselessness. For more information on this tremendous future — on your future — request our free booklets Your Awesome Potential — How Religion Has Deceived You and The Wonderful World Tomorrow — What It Will Be Like. Let's learn how to work and how to love work. We can build character and make our lives richer, fuller and happier by applying Solomon's admonition: "Whatever your hand finds to do, do it with your might " (Ecclesiastes 9:10). Most of us are shocked when we begin to understand what the Bible says about our human potential. We learn, contrary to what we may have been taught about a heavenly eternity of idleness, that God's purpose for us involves His entrusting us with rulership! We are to have responsibility on a far higher level than most of us have ever come into contact with, let alone exercised. We learn from the parables of the pounds and the talents (Luke 19:11-27, Matthew 25:14-30) that we will receive different degrees of reward in God's Kingdom based on what we do with what we are given in this life. And there are few activities in this life that take as much of our time as our jobs. But it is sometimes puzzling to understand how God could be training us now for such exalted leadership. Have you ever looked at the job you do and asked yourself, "Why would God call a house painter (salesman, baker, housewife) to have a part in His Kingdom?" Some have wondered whether they should change from their present occupation to another that would seem more suitable for training them for the Kingdom. Since God tells us we will rule over nations (Revelation 2:26), should we try to switch from a craft or vocation, for example, to management? Since Jesus Christ speaks of giving us authority over cities (Luke 19:17, 19), should we seek experience in city government? Just what is the relationship between our work now and our work in God's Kingdom? To begin to understand, let's take the example of a draftsman. Consider all the technical skills he must acquire for his job — skills such as understanding proportion and scale, the ability to visualize a three-dimensional shape and represent it in two dimensional drawings, understanding principles of design and proper drawing techniques and lettering styles. How could these skills be preparing him for a high position of governing and ruling people, judging them and helping to solve their problems in the Millennium? He will probably use these specific technical skills little. A draftsman might conclude that his job doesn't have much to do with what he will be doing for all eternity. But now let's look at some of the less technical aspects of a draftsman's job. How does he manage his time? Does he meet his deadlines? Does he strive to meet the needs of his clients? Can he work with the carpenters, who must construct buildings based on his drawings? Is he loyal to his employer? Is he motivated, diligent and alert? When we analyze his job in that way — studying not his technical job skills, but his work habits and skills in human relations — we can see that much of what a draftsman is learning today will be excellent training for his life as a future God and ruler. Your work skills may someday be obsolete. But not so with your work habits and human relations skills! They're a part of your character. They show not only how you do your present job, but how you are likely to do any future job, including your responsibilities in God's Kingdom. Let's understand: The ability to write a computer program is a technical work skill, but the ability to carry out explicit, detailed instructions is a work habit. The ability to operate a chain saw is a technical work skill, but the ability to work for long periods without supervision is a work habit. Because they are part of character, our work habits are highly important to God. But they are also important to employers now. Employment counselors stress that while work content skills may determine whether you'll be hired for a certain job, it's primarily your work habits that will determine whether you keep it. There's another important difference between technical work skills and work habits: Work skills can be learned by practice or study. However, work habits, as part of our character, are part of who and what we are. They change only through diligent effort to overcome, sometimes over long periods. Could your work habits use a refresher course? The proper place to start improving them is with the Bible. This book, the foundation of all knowledge, has much to say about good work habits. In Colossians 3:22, we're told to obey our masters in all things. One trait on which God will judge us is whether we can carry out instructions on the job. This verse continues, "Not with eye service, as men-pleasers, but in sincerity of heart, fearing God." We've all seen those who can produce quality work quickly — but only when the foreman or boss is watching, or when a promotion or salary increase is at stake. Are we the same? Verse 23 adds: "And whatever you do, do it heartily, as to the Lord and not to men." We shouldn't let our boss's shortcomings distract us from the understanding of this verse — that our real boss is, and always will be, Jesus Christ. God knows we won't work any differently as members of His Family than we do now. An alert, energetic approach is a work habit we can use in any occupation. Are good work habits important solely for those with jobs outside the home? What about homemakers? Proverbs 31 describes the virtuous woman. It tells us much about her work habits. This woman is trustworthy, industrious, generous, compassionate and. wise. We aren't told how she did her laundry — that's a technical skill that has changed over the centuries. Her work habits, though, are still valuable for us to emulate. Homemakers might analyze their tasks in the light of the work habits they need to excel. No household I know of just magically falls into order each week. Its management takes forethought, organization, perseverance and flexibility. What if you are now unemployed? Does that make it impossible for you to qualify for a reward? Not at all. You may not realize it, but if you are unemployed, you have a full-time job: looking for work! Finding a job in today's tight job market requires imagination, resourcefulness and, above all, constant effort — in other words, the same traits necessary to perform well once you have a job. God looks quite closely at our performance on the job as a leading indicator of how we will perform for all eternity. Few have the opportunity King David of Israel had — to qualify for his position in God's Kingdom by doing that same job in this life. Yet, remember the great reward given to the one who had proven faithful in little (Luke 19:17)? Every day on the job, we reveal to God how we would handle any responsibilities in His Kingdom. Whatever our job, career or occupation, let's work at it to qualify for an abundant reward.